NASA Press Kit for Space Shuttle Mission STS-53 to be launched Dec. 2, 1992. Primary payload is for the Dept. of Defense. major military payload currently planned for the Shuttle fleet. 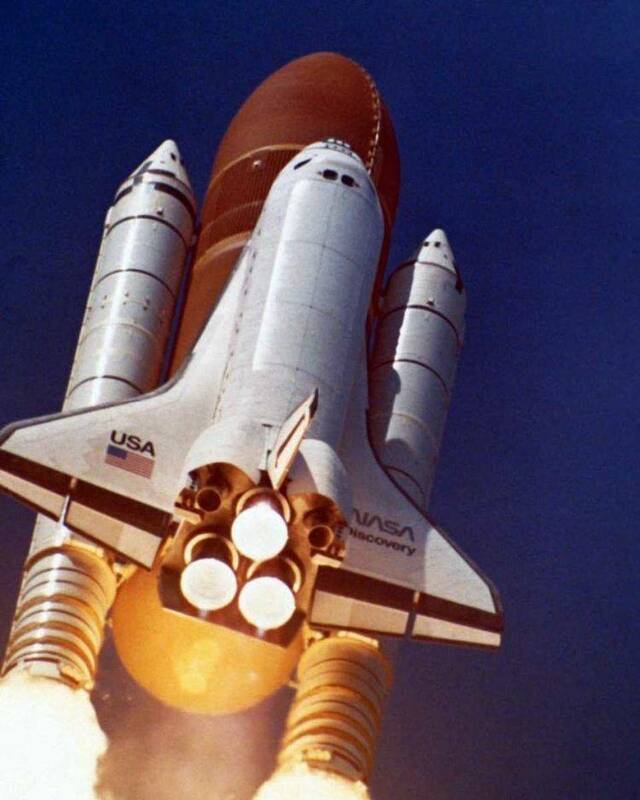 the Shuttle since 1985," said NASA Administrator Daniel S. Goldin. Secretary of the Air Force (Space). dangerous debris in low-Earth orbit. Bluford and Jim Voss their fourth and second, respectively. represented by the all-military crew. to that of its spaceborne peers. a separate document no later than one week before launch. 3960.0 MHz, audio 6.8 MHz. reflect changes dictated by mission operations. schedule is updated daily at noon Eastern Time. Primary Landing Site: Kennedy Space Center, Fla.
intact recovery of the flight crew, orbiter and its payload. with orbital maneuvering system engines. at either Zaragoza, Spain; Ben Guerir, Morocco; or Moron, Spain. gliding distance of the Shuttle Landing Facility. Base to Kennedy Space Center on Feb. 16 and rolled into OPF bay 2.
pods, the three main engines, and the body flap. were conducted and the freon service loop was reserviced. the pad and take their assigned seats in the crew compartment. Space Center's Shuttle Landing Facility. water dumps and flash evaporative cooler system operations. configure the AIS (exposure time, number of detectors to use). the POCC so viewing by the experimenters is near real-time. sensors, instruments and space vehicles. action moves the fluid back to the evaporator end. ammonia or Freon used by most heat pipe concepts. U.S. Air Force Wright Aeronautical Laboratories, Dayton, Ohio. activity requires power, data or command services. needs of the primary payloads. experiment will release six calibration spheres from Discovery. greater than 620 nautical miles (1,000 kilometers). the Super-RADOT telescope facility in the South Pacific. scattering properties are well known. System. Clifford will verify the ejection of all six spheres. telescope and radar systems in initially locating them. and motor and structural support. spheres, made of solid aluminum, weigh 11 lbs (5 kg). Adelphi, Md., and the Night Vision Electro Optics Directorate, Ft.
the Department of Defense's Space Test Program. up at various DoD field locations. of the angle at which clouds are viewed from orbit. meteorologists on the ground and relayed to the Shuttle crew. severe weather, to include thunderstorms and tropical storms. the study of high incidence angle effects. direction of the Department of Defense's Space Test Program. ray energy loss spectra, neutron fluxes and induced radioactivity. placed at specific locations throughout the Orbiter's cabin. attempt to correlate data between the two. be analyzed after the flight. packages. All hardware fits in one locker on Discovery's middeck. region of trapped radiation over the South Atlantic. investigate the dynamics of fluid transfer in microgravity. pressure gauges and a flowmeter display unit. vent connected to the orbiter waste management system. during the flight, using a sequence of manual valve operations. remove the vapor from the receiver tank as the fluid level rises. consult with the principal investigator. will not be conducted until after the mission. containment, such as the FARE equipment. the image and determine the latitude and longitude of the feature. The project is a joint Navy, Army and NASA effort. the camera at the Earth and snapping the shutter. from the gyro and determines its absolute orientation in space. then determines the longitude and latitude of the image. to automatically track points on Earth. the direction of the Department of Defense's Space Test Program. properties vastly superior to microcapsules made on Earth. a-day oral formulations and once-a-month injectable formulations. pharmaceutical products of the future. be flown on several future Space Shuttle missions. future long- term space missions, such as Space Station Freedom. endothelial and white blood cells under various conditions. and drugs on cells in the microgravity environment. white cells respond to antigens from infectious agents and tumors. minimize bone failure in space and on Earth. prolonged bed rest and aging. effect of microgravity on visual function. Department of Defense Space Test Program secondary experiment. David M. Walker, 48, Capt., USN, will command STS-53. Fla., his hometown and will be making his third space flight. received a bachelor's degree from the Naval Academy in 1966.
logged a total of 289 hours in space. hometown and will be making his second space flight. School in 1981 and was assigned to the Naval Air Test Center. Cabana has logged more than 4,100 hours in 32 different aircraft. October 1990. He has logged 98 hours in space. University of Houston in Clear Lake in 1987. University of Colorado in 1974.
astronaut. His first Shuttle flight was STS-44 in November 1991. Voss has logged 166 hours in space. engineering from the Georgia Institute of Technology in 1982.
engineer until his selection as an astronaut. AMES-DRYDEN FLIGHT RESEARCH FACILITY, EDWARDS, CALIF.